In the world of rock n roll where I’ve resided for most of my life, letting go typically means you don’t care. You get wasted and numb yourself to the pain. You no longer care what anyone thinks. I’m talkin’ about letting go intentionally and consciously. This kind of letting go means releasing those pent up emotions that accumulate and become an undercurrent of anxiety, fear, and limiting beliefs. First, there’s the question of why would you want to let go. Why surrender? I’m talking about what happens when you allow your feelings to simply be rather than suppress/numb them away. Here’s the first cool thing to know about surrender. Thoughts are a rationalization of emotions. So once you truly release a feeling, your thoughts will shift, too. Here’s a second cool thing about surrender. It doesn’t have to take a long time. We’re not talking months or years of hard work and concentrated effort here. Nope. You can let go in an instant. You make the conscious decision to let go of an emotion and as you realize this is possible, it happens. It’s not about who’s right and who’s wrong. It’s not about who owes you or what serves you. It’s not about being angry at someone because they deserve your rage. Surrender is about you being the most ideal version of you. 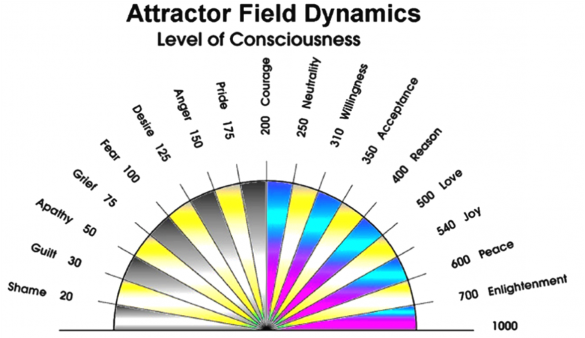 When you shift into a more ‘good’ feeling emotion, you’ll vibrate at a higher level and that’s when you attract more of that stuff you probably want like more abundance, more love and more joy into your life. How do you let go of anxiety? Think of a situation that upsets you. Maybe you have a pile of unpaid bills. Maybe you have someone in your life that keeps showing up in ways you don’t like. Maybe you don’t like your appearance. Maybe you’re not where you think you ‘should’ be in life. Choose one scenario and allow yourself to feel anything that comes up. Now, can you touch this emotion? Can you see it? Can you draw it out and make it into a tangible object? Yet, this invisible force of limiting emotions will spin itself into limiting thoughts which transform into limiting beliefs which then inform us of our lack and undeservedness and any other myriad of nasty, yucky crapola. Ask yourself if you can let this feeling go? Do you want to let this feeling go? Often we berate ourselves by thinking we ‘should’ know better. We simply ‘shouldn’t’ feel a certain way because it’s childish. Everyone has feelings of guilt, shame, fear, anger and pride that come up at the most inopportune times. Here’s 3 ways to let go of anxiety. The next time you’re hanging out with your family and your buttons get pushed by a parent or sibling, pause and breathe. Let that emotion come up and pass through you. Imagine it’s rising up through you and out of you. Let it go. Rather than reacting how you usually would, take a pause. Take a deep breath. Walk away if you need to and get re-centered. Think back to a childhood event that made you uncomfortable. Maybe a day in school where you were ridiculed or felt lonely. This one event has probably birthed thousands and thousands of thoughts. Any time you’ve remembered it, you’ve had thoughts about it. Now release the emotion that happened back then. Let it go. See it as smoke and vapor and it’s rising up from the ground and going into the cloud. Look at the peripheral emotions and feelings that arose from it. Let those go too. Now focus on a current relationship in your life. The most common challenge in relationships is wanting the other person to be or behave a certain way that is more to our liking. Consider the emotion that comes up for you around a challenge like that. Visualize yourself with your arms out and your palms up. See yourself as completely open. When you are open you have to let go of whatever is in your hands. Think of this feeling as liquid and it’s pouring out of you. As it leaves, the feeling becomes lighter until it is merely vapor. This scale is from David R Hawkins, MD who studied spirituality, emotions and the path to enlightenment extensively. As you move through the process of letting go of your emotions and the need to be right shifts into the ease of being, you will keep shifting up the level of emotions. The higher up you go, the more you will attract what you truly seek because as we know, like attracts like. What can you surrender today?